Two months … please make time stop! These last two months have been the most amazing two months of my life. Every day I grow more and more in awe of this sweet angel. 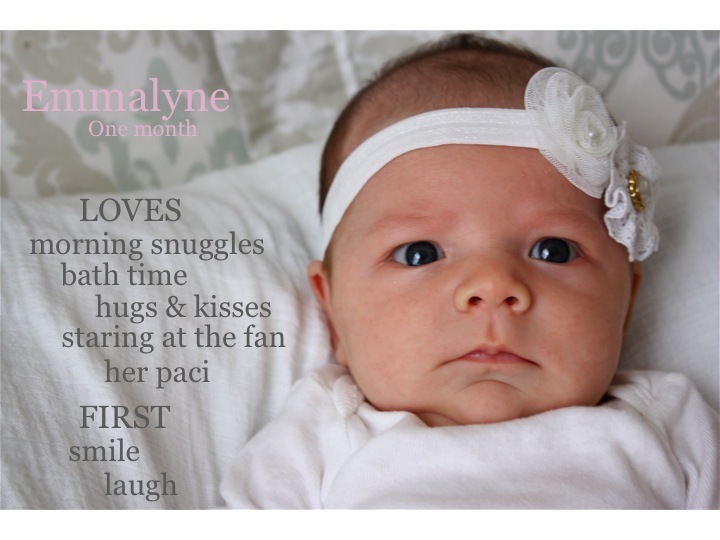 Didn’t see Emmalyne’s one month update? Find it here! So how does Emmalyne measure up? She absolutely loves to hold her hands across her chest. When she does she looks so peaceful … almost like she is meditating. It’s so funny how much her personality is starting to come through. She is happiest first thing in the morning and usually greets us with many smiles when we change her diaper! The cutest thing is she has started discovering her voice and has little conversations with us. I love it! We have really adjusted to her new schedule. She goes down for her naps incredibly well … on most days that is 😉 She sleeps for a solid 6 hour stretch at night which is awesome! Hopefully she will start extending that a little bit more soon. I really think she grows every single day. I put on an outfit the other day that she wore home from the hospital … it fits now! In fact, the legs are a little short. I just want time to stand still. I am so incredibly thankful. I can’t believe that God trusted ME with this treasure. She has taught me so much in these last two months … I look forward to a lifetime full of lessons. Where has the time gone?! I cannot believe that my sweet angel is already one. month. old. Holy Cow! It has been an incredible month getting to know our baby and seeing her personality come through. 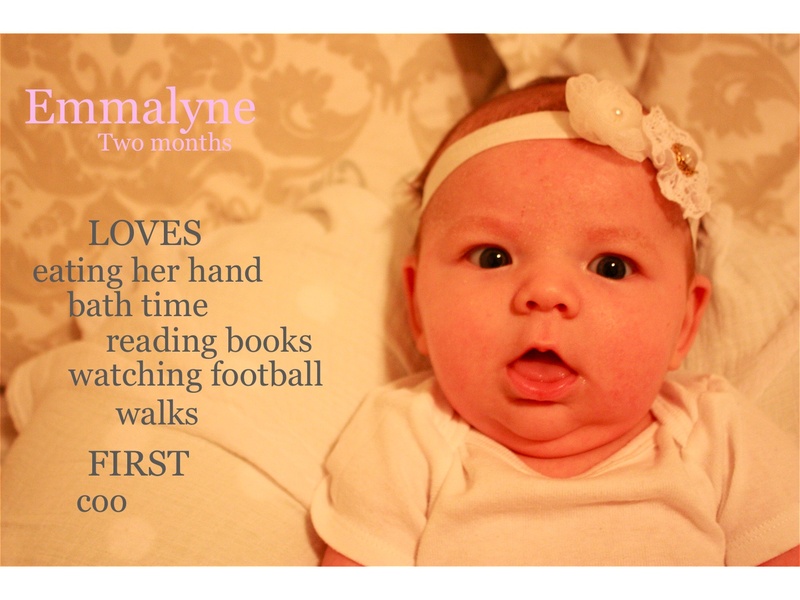 Emmie truly is an easy and awesome baby. Since day one she has been pretty mellow and easy going. She only cries when she needs a change, is hungry, or is over-stimulated. She has also been an incredible sleeper. Her one-month gift to her daddy and me? Sleeping through the night! Emmie officially graduated out of newborn diapers and clothes this week. We are now on to size one diapers and either 0-3 month or 3 month clothes. She is just so LONG! I honestly can’t believe that this blessing is MINE. I could stare at her all day long and just smile. I cherish these moments because I know they are fleeting. I love you baby girl! You are my sunshine.